The date is the fruit of the date palm. It is a berry of golden yellow colour or reddish-brown when ripe. Its meat is soft, aromatic and sweet, with a stone inside it of elongate shape and with a longitudinal furrow. Dates are consumed fresh or dry and represent a basic food for the inhabitants of North Africa and Near East, who are the main producers. Dates mean an important nutritional contribution in the diet of the Arabs of the desert. Their main nutritional contribution are glucids. The cellulose (fibre) occupies an important place too, but the percentage of proteins and lipids is scarce. The nutritional value of soft dates is superior to that of dried dates. The former provide with a larger amount of carbohydrates, lipids, fibre, vitamins and minerals. 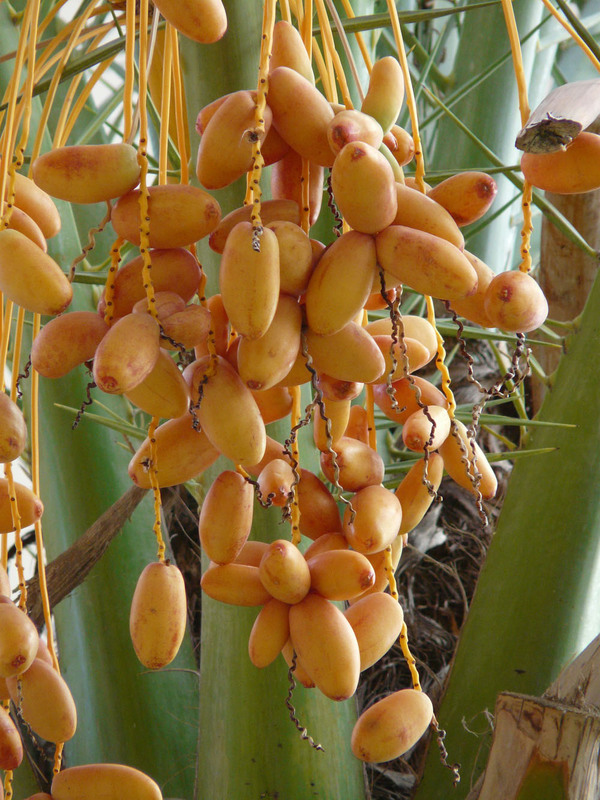 The date (Phoenix dactylifera) is the fruit of the date palm. It is a berry of golden yellow colour or reddish-brown when ripe. Its meat is soft, aromatic and sweet, with a stone inside it of elongate shape and with a longitudinal furrow. These fruits have a similar taste to honey and grow in clusters in the crown of the tree, around 25 m high. In North America they are related to sweet meals and in the Arab countries they are eaten stuffed, crystallized, distilled, in salads and with couscous. In India they are used to prepare chutneys and curry. In the Sahara oases and other parts of North Africa they make date cakes intended for feeding the groups of travellers. In the Middle East they make the palm wine or toddy by means of fermenting the sweetened sap extracted from the crown of the date palm. Dried dates are kept in fresh and dry places for several months, even a year. The soft varieties are stored in the fridge for two weeks. The optimal relative moisture of this fruit is between 70-75%. They have a great nutritional value that lies on its easily assimilated sugar content and proteins, calcium, phosphorus, iron and vitamins of the B and A group. The palm (Palmaceae) represents one of the most numerous families of tropical plants. The scientific name of the palm is Phoenix Dactylifera. There are almost 200 genus and more than 2,000 species of palms. The great majority is native to the deserted areas of Asia and America, except for some that come from Africa. 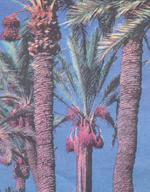 These plants, mainly the date palm and the coconut palm, are of vital importance for the towns of the warm countries. The date palm (Phoenix dactilifiera) is the plant bearing dates. This dioecious tree usually measures 15 to 25 m high. It is provided with abundant and long palm branches, that does not bear fruit before until it is 5 or 6 years old. The yield is around 70 kg during 30 or 40 years. It can live for more than 2 centuries. The date palm has to be, as an Arab proverb says " with the feet in the water and the head in the fire’. On the one side it needs the sun rays and on the other a humid soil, from which the roots extract water in a radius of 6 m. In these conditions it will bear an abundant output. These needs have turned it to be a characteristic tree of the desert. The fruit which is consumed fresh is not harvested until fully ripe, but the fruit intended for exporting as dry fruit is harvested before maturation.